We're pleased to introduce one of the newest additions to our superfood tea family. You will not find this flavorful tea offered by any other company. 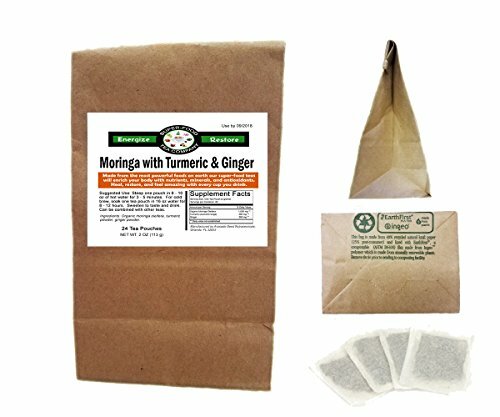 We have no doubt you'll love this awesome moringa tea blend as many of our local customers currently do. Drinking our tea is one of the easiest ways to incorporate superfoods into your daily diet. Buy yours today, feel great, and get hooked for life! We started four years ago juicing wheatgrass at the farmer's market. Through divine inspiration and your support, we've grown into several brands with dozens of products that heal and restore. Our success is humbling and we take nothing for granted. We remain committed to our core values (Healthy + Easy + Affordable), and supporting your health. We appreciate you! Considered to be nutritional dynamite and one of the healthiest plants on earth, Moringa's demand is quickly growing as it's consumed in many parts of the world to fight malnutrition and sustain basic health. Moringa Oleifera will energize your body providing vitamins, minerals, and antioxidants. Ginger root has sustained the health of humans for thousands of years. Primary benefits include digestion + nausea relief, however the full list of benefits are extensive. Turmeric has a long history of being a healing food. It's a staple in the diet of people from India for this reason. The countless benefits of this wonderful gift from nature have finally been recognized by modern research, health practitioners, and doctors alike. New Low Price + More Tea Bags - As a result of our growing success, we've lowered our price and increased the quantity of tea bags to 30. Enjoy! Our #1 focus is creating amazing and affordable super-foods because good health should be available for everyone. We manufacture 100% of our products unlike many Amazon sellers of health products who simply buy wholesale and resell. Every product is tested, approved, and depended upon by our loyal following of local and online customers. If you have any questions about this product by Super-Food Tea Company, contact us by completing and submitting the form below. If you are looking for a specif part number, please include it with your message.